Presenting his book as a field guide, Gosse took his readers on an enthusiastic exploration of the Devonshire shore, filling their senses with the sights, scents, sounds and textures of the tide pools and their diverse inhabitants. From his detailed descriptions of luminescent medusas to his eloquent reflections on the divine origin of species, Gosse’s passion was infectious. 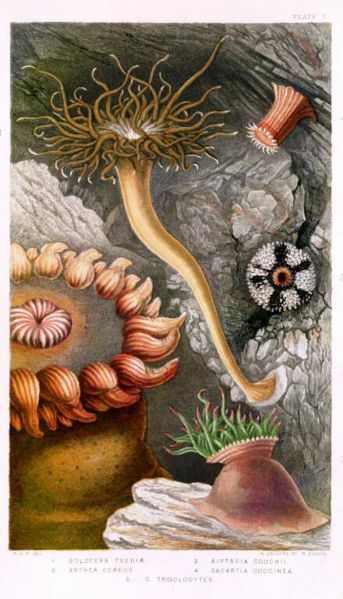 His readers, who had already been filling their parlours with collections of eggs, feathers, butterflies and dried flowers, now flocked to the seashore bearing glass vessels in which to haul home aquatic specimens. 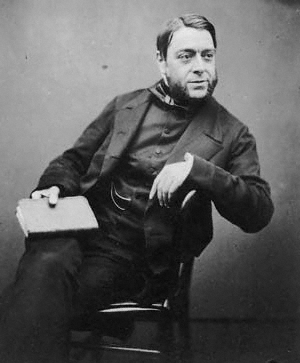 Through “Rambles” and his subsequent books ( including, The Aquarium, an unveiling of the Wonders of the Deep Sea, in which he instructed readers to use his new term “aquarium” in place of the old and unwieldy “aqua vivarium”) Gosse is credited with launching the public’s fascination with aquatic life and the Victorian zeal for “parlour aquariums.” But nothing compared to the frenzy he ignited when, three years after completing construction of his own public aquarium, The London Fish House, Gosse opened an animal exhibit featuring four creatures that had never before been seen in a live display. By now Londoners had grown accustom to seeing unusual creatures from faraway lands. While Charles Darwin toiled over the final chapters of On the Origin of Species, a steady stream of British collectors had been returning to port, their ships laden with exotic flora and fauna plucked from every corner of the globe. The London Zoological Gardens, final home for many of the living curiosities, attracted crowds who poured through the gates to see for themselves such creatures as the Arabian oryx, the orangutan and the now-extinct marsupial wolf, the thylacine. But on a May day in 1859 Gosse astonished his vistors by displaying, for the first time, living seahorses. The four enchanting creatures instantly captivated Londoners who came in droves to marvel at these strange and beautiful animals. Soon seahorse-watching became a national fascination. As word spread, public aquariums sprouted up all over Europe, invariably giving seahorses marquis billing on opening day. At home, Victorian women, charmed by their aquatic antics, kept seahorses as pets in parlour aquariums. Even as the aquarium craze itself tapered off, the fairy tale creatures continued to hold sway over the public imagination for decades, inspiring newspaper and magazine articles (often given to blending biological fact and anthropomorphic fantasy), stories, poetry, toys and ornamentation. Gosse went on to write more books, most famously, Omphalos: An Attempt to Untie the Geological Knot, an ambitious thesis in which he tried to reconcile Charles Lyle’s geological ages with the biblical account of creation. But his timing was bad. Evolution was already in the air (Darwin’s Origins would come out just two years later, in 1859). Omphalos (Greek for navel) was soundly rejected by both scientists and theologians and sold few copies. Sadly, although he went on to publish four more books and dozens of scientific papers including studies on sea anemones, orchids, and the genitalia of butterflies, Omphalos came to be Gosse’s unfortunate legacy. But I’ve read much of A Naturalist’s Rambles, and even today, 150 years later, Gosse’s enthusiasm is still infectious. Honestly, doesn’t this make you want to kick off your shoes, wade into a tide pool, and fish out a prawn of your own? I will just observe that it is a “sizeable” fellow that is now before me, whose portrait I am going to take. Stand still, you beauty! And don’t shoot round and round the jar in that retrograde fashion, when I want to jot down your elegant lineaments! There, now he is quiet! Quiet but watchful! Maintaining a sort of armed neutrality, with extended eyes, antennae stretching perpendicularly upwards, claws held out divergently with open pincers ready to seize, as if those slender things could do me any harm, and feet and expanded tail prepared in a twinkling to dart backward on the least alarm. So yes, Gosse was eccentric. Yes he couldn’t see past his preconceived notions of divine creation. Yes he was fretting over whether Adam had a belly button while his contemporaries were discussing the geological record and the malleability of species. And yes, he eventually was seen as a bit of a laughing stock. But today I prefer to remember Philip Henry Gosse as the man who brought us seahorses. Omphalos was also released under the title Creation (Omphalos). A scan is available from archive.org.